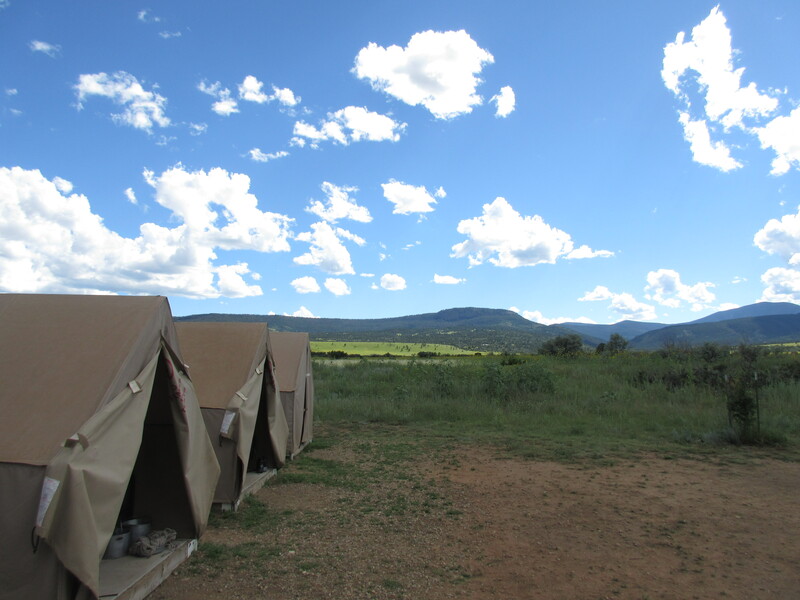 About 3 (ish) hours later we arrived and saw our first “red roof” buildings nestled into Cimarron, NM. 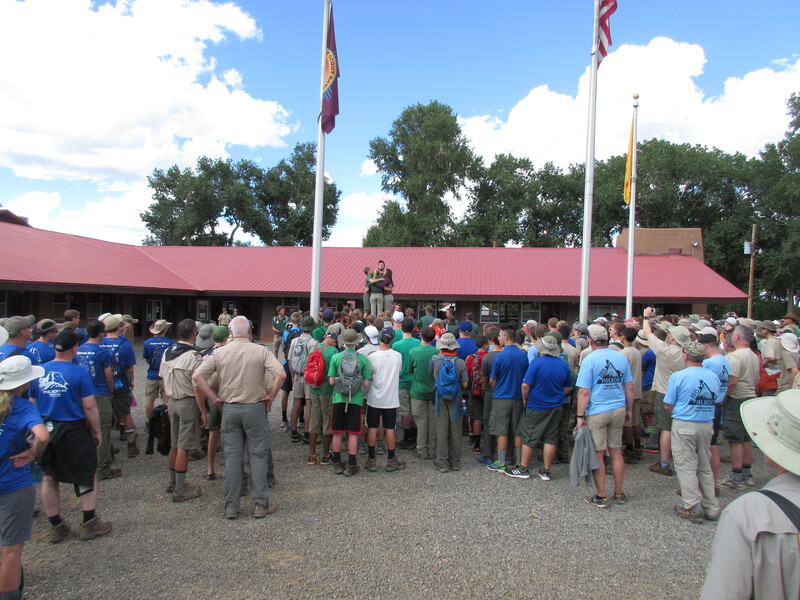 Upon arrival at Philmont we were greeted by our first friendly face and a whole bunch of other scouts and scouters in the “Welcome Center”. Our guys played cards whenever we had more than 3 minutes of down-time. We met our ranger (rain-jur: Noun. 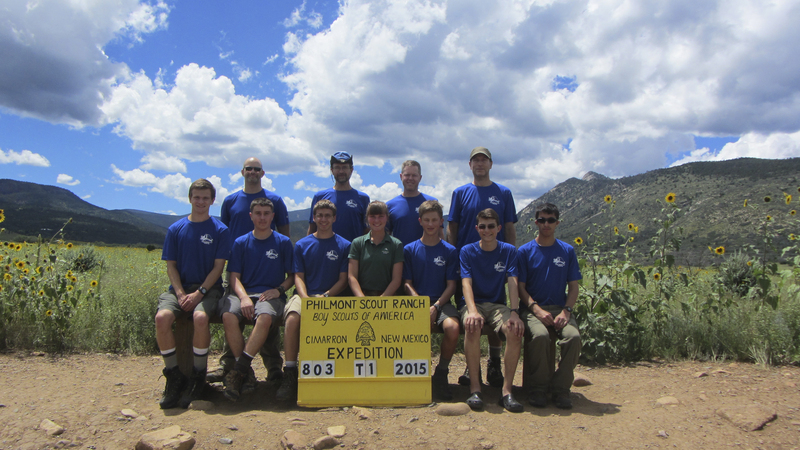 A Philmont-supplied college student guide that makes sure that you do not die within the first 72 hours of your trek), split into our two crews and went to go do the things we needed to do to get on our way. First thing we did was drop our backpacks at our tents. These canvas-like enclosures were sturdy 2-person sleeping quarters with concrete floors. They had two cots with mattresses in them and were definitely an upgrade to the backpacking tents we had been using for the previous two nights. Then it was time for lunch. 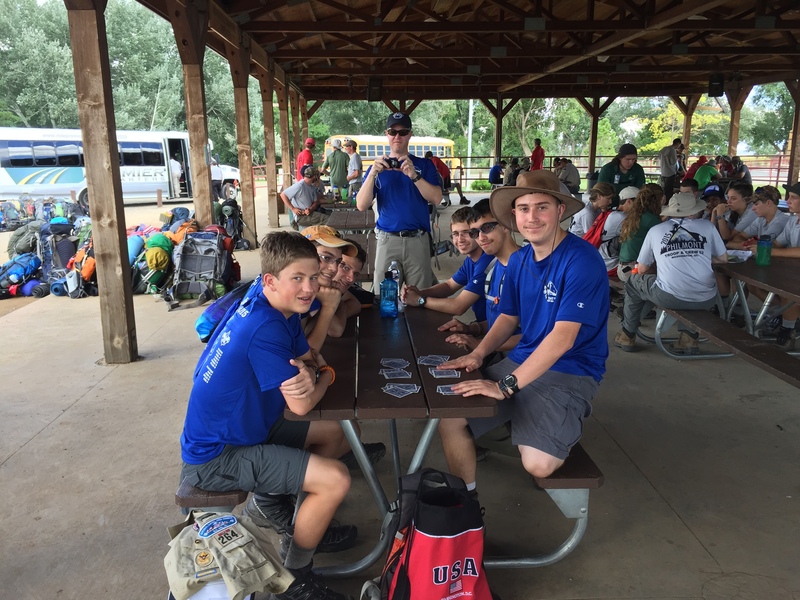 All scouts and scouters gathered at the dining hall (think of a nice school cafeteria) and waited to be called to get our food. The rangers (visible in the top of the picture below) usually had an interesting way of ringing the food bell to let us know we could go in. Here they all sang something an then did a “trust fall” backwards into the arms of other rangers. Was pretty cool. Our next stop was to get our search and rescue pictures taken. Yup. They told us that they needed good pictures of us “just in case” they needed to go look for us or ID our bodies. Greeeaaaatttt. Our ranger, Anna, sat with us I guess so they’d know who to blame if we got killed or something. Just kidding (kinda). We had to ship our stoves (due to the flammable fuel) and went to pick those up along with all the food we’d need to carry for the first bunch of days. 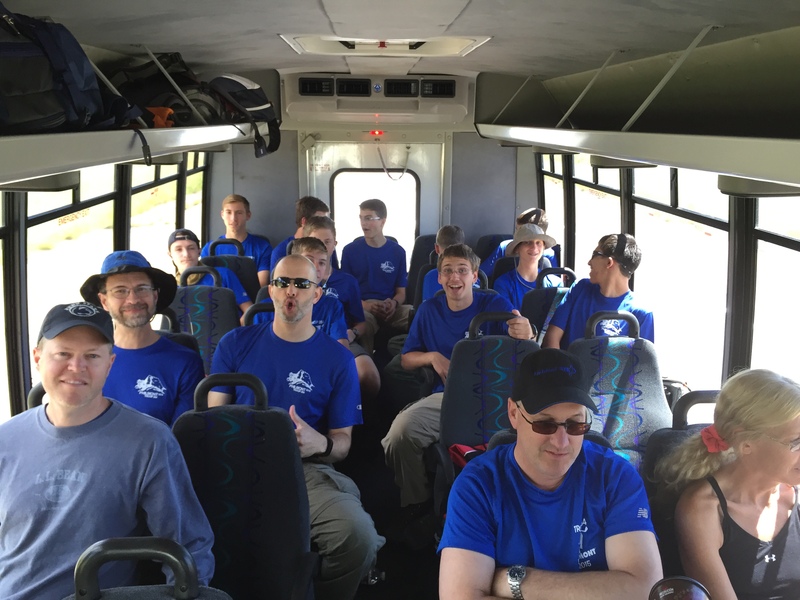 I think our initial load was three full days of food and then also a breakfast and lunch for the forth day. My son and I are lacto-ovo vegetarians; we eat eggs and dairy but no animals (fish, chicken, pork, beef). This presented a problem for us as the main protein items in each meal were generally meat-based. 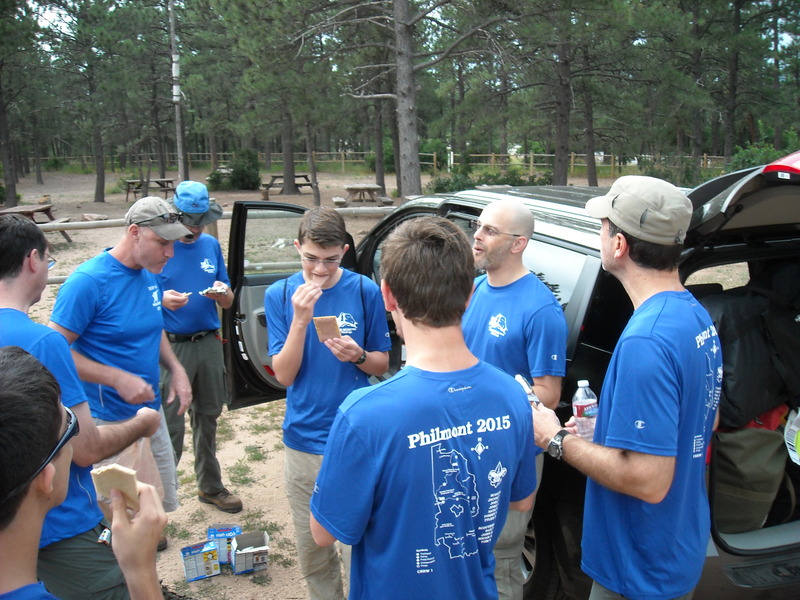 I mentioned in https://webbreacher.wordpress.com/2015/08/18/philmont-fun-the-basics/ that Philmont had excellent documentation about what it was going to feed us for every meal. My son and I used this information many months prior to leaving Maryland to figure out the best protein-replacement foods for us. For breakfast, we shared one bag of Louisville Meatless Jerky. These soy-based products were good and salty and had a decent amount of protein for breakfast. They also didn’t make our hands all slimy. We augmented lunch with a high-protein energy bar. Having a plethora of choices, we sampled a wide variety of these products at home before settling on Clif Builder’s 20g Protein Bar. Our concern with these, and most of the other 20g protein bars, was that they were always covered in something that would melt. This bar had a chocolate covering and, sure enough, in the heat of the desert it melted then cooled at night then re-melted…etc. Some of the bars were quite interesting looking when we went to eat them. Finally, my son and I chose several dehydrated backpacking meals for dinner entrees. In fact, we bought a bunch of them and, for our family dinner one night, my whole family just had these backpacking entrees which we then rated and picked our four favorites. Those I bought 3-4 of each to bring with us. If you are interested in which ones we chose, leave me a comment below and I’ll add that. 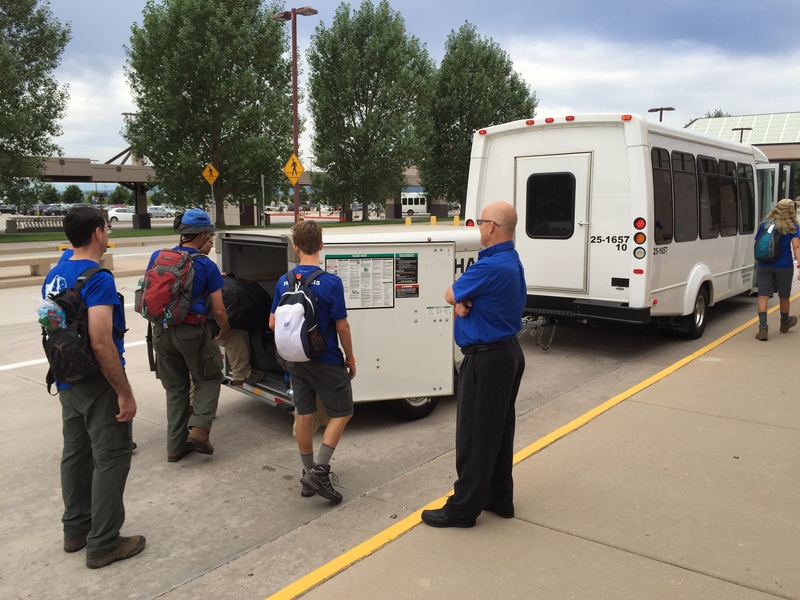 The reason I bring all this up is that our crew (bless them) had to not only carry the normal food for 3.5 days but also our additional vegetarian food as Philmont sealed all of the meal bags so we couldn’t just replace the “extra meat” portions of our meals with our veggie substitutes. Really felt bad for making others carry our extra weight but do appreciate their efforts! Oh! Almost forgot. Here is what all our food bags looked like when we got them. We had dinner. Some people attended religious services. We had free time to visit the Tooth of Time Traders, a gift shop meets REI store that had everything you could want for camping/hiking and remembering your trip. I don’t have pictures of it but later in the evening, the adult advisors were invited to a meeting where we were told explicitly that “we were on vacation” and that the “scouts will do everything”. Must say that I didn’t like that as I like to pull my own weight. We’ll talk more about this along the trek. The ending event of the night was a welcome campfire which was a nice way to bring all us people heading out to the back country together. There were some really pretty lightening storms off in the distance that we watched during the camp fire. Then it was back to our tents for sleep. We slept and then…well, that is the next blog post.